Skorpios: the small island on the Ionian Sea, where legendary tycoon Aristoteles Onassis married Jacqueline Kenndy, changes ownership. Half a century after Onassis purchased the island, his granddaughter Athina, 28, sold it to Ekaterina Rybolovlev, 24, daughter of Russian billionaire Dmitry. After several days of scenarios circulating in the Greek press, Reuters confirmed on Saturday: “The daughter of Russian billionaire Dmitry Rybolovlev has bought the Greek resort island where shipping tycoon Aristotle Onassis famously married Jacqueline Kennedy in the 1960s, Rybolovlev’s investment office said. “Ekaterina is delighted that the trust has negotiated this purchase,” a representative of Rybolovlev’s family investment office said on condition of anonymity. “She regards the acquisition as a long-term financial investment.” She also acquired the small neighboring island Sparti, Reuters noted. The sale price was not disclosed. Greek media reports on Saturday placed the value of Skorpios island at over $100 million. Media had reported in the past that the value of the island was even 220 million USD. Athina Onassis Russel, daughter of Christina Onassis and French Thierry Russel, is the only direct surviving descendant of Onassis family. She is married to Brazilian professional show-jumper Alvaro de Miranda and she hardly visits Greece. She seems to had not special bonds to Skoprios, where Aristostle, son Alexandros and daughter Christina are buried. Greek media report of several obstacles for Skorpios sale, as the will of Onassis was ruling that the island should go over to the Greek state as holiday resort of the political leadership, if his wife and daughter would not be able to come up for the maintenance cost. Sparti island would be donated to Olympic Airways personnel and operate as summer camp for their children. Skorpios would also go over to OA personnel if the Greek state would not want to accept the donation. However, as the island is managed by two companies owned by Athina Onassis, the new owner apparently bought the shares of the companies. Shares transfer could very well bypass the legal obstacles. Not to mention that no Greek politician would dare to challenge multimillionaire Athina Onassis Russel, while Olympic Airways is not a state company since a couple of years. Locals are not pleased with the sale of Skoprios with the mayor and other local personalities raising the issue of sale legitimation, while they are expressing their concern whether the new owner would respect the originality of Skorpios, its myth and its natural beauty. The mayor of the nearby island of Meganisi, Efstathios Zavitsanos, who is administratively responsible for Skorpios, told Reuters that the deal was likely to be a long-term lease since, according to some lawyers, Aristotle Onassis’s will stated that Skorpios could not be sold or leave the family. Rybolovlev’s office said that Ekaterina wanted the island not only for leisure but also business purposes. Aristotle Onassis bought Skoprios in 1963, a barren island at that time, and turned into a natural paradise by planting tress and even transferring sand from Mykonos island. 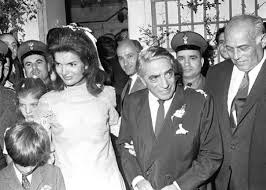 In 1968, Skoprios became the focus of international media when Onassis married former US First Lady Jacqueline Kennedy, widow of the assassinated U.S. president John F. Kennedy. Previous Previous post: Why give this man Michael Wilkins money to go on a fantastic ride?